My son and his girlfriend frequent a small Thai restaurant nearby and have been trying to re-create Thai dishes at home. Not that simple if there is no Asian market nearby. My son prepared this dish for us recently. I barely did anything except go from market to market with him to try and find a fresh green papaya. This Asian variety is honeydew color on the inside with white seeds, not the typical orange-flesh that we are familiar with. We couldn't find it anywhere. Of course, we could have taken a trip to an Asian market in New York City, but that was a bit extreme. I wonder where he gets his determination from? The recipe calls for the papaya to be shredded. We bought the hardest papaya we could find. Got home, pulled out my Mandoline and tried to shred this papaya. We ended up with strings of soft, mushy threads. Ok, what now? We had to improvise. We had all the other ingredients and wanted to finish the dish. The only thing I could come up with was to try Jicama - crunchy flesh, used in salads. They never heard of it. After a bit of research and some google attempts, we had two alternatives; shredded cabbage or cucumber. When we thought about the raw cabbage, that didn't go over well, so we decided on the cool, crispy cucumber. I wrote the recipe with the original ingredients called for, and put in our substitutions. This is Brian's version of Som Tum - it really was deliciously different! In a medium pot, bring salted water to a boil. Add shrimp and cook approximately 7 minutes, or until shrimp are just cooked through. Since the green beans needed to be blanched, I added them to the shrimp to save a step. This is all I did. Brian did the rest. The original recipe call for a mortar and pestle to crush the garlic and the chilies. I suggested to my son to grate the garlic on his "new" Micro-plane". Used crushed red pepper flakes for the chilies. The dressing for this salad is done spoon-by-spoon, taste as you go. I asked him to go easy on the fish sauce for my serving. Wow! That looks so good and healthy. Yum! 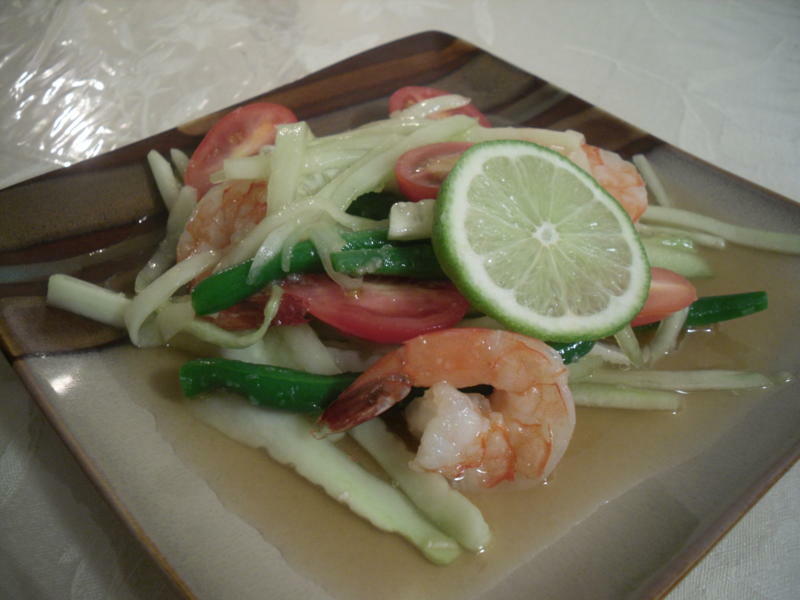 I love all Thai recipes; always so incredibly FRESH!!!! I'm so glad that I found your blog! Yummy recipes!